03-Jul-2003 -- Roundtrip we spent 6 days and 70 miles backpacking to this confluence and back. It is located near the headwaters of the Yellowstone River, on the continental divide in the Bridger-Teton Wilderness Area, adjacent to Grand Teton and Yellowstone National Parks. I (Scott) first heard of the degree confluence project almost a year ago. My brother had sent me a link to the site, talking up the pictures and stories. After a bit of browsing, I quickly became interested in hunting a confluence even though I don't have a GPS. Indulging my curiosity, I checked out the few unclaimed confluences remaining in the western U.S., and found a handful of spots in northwest Wyoming. I soon discovered why they remained unchallenged - they were mostly in wilderness areas far from any roadway. The idea to go for this particular confluence really developed as a whim. It was reasonably close to home, but so deep in the wilderness area that getting there would require a few days and some major orienteering. It looked like one of the toughest spots was left for last. Basically I had an adventurous idea with no real means of getting there. But the excitement of this challenge stayed with me for several days, and an idea soon came together in my head. I was serving in church as an advisor to a semi-interested group of venture scouts who needed a fresh idea for next summer's high adventure trip. With encouragement from my wife and interested friends, I decided to pitch the idea to the group. To my surprise, once the whole confluence thing was explained and where I wanted to go, our Bishop and his counselors almost immediately became obsessed with the idea. Interestingly, we discovered Eric Bowman, a member of our congregation, had been to this part of the Bridger-Teton wilderness before. Eric ended up being an invaluable resource providing input to our planning process, which spanned the next several months. Although the confluence was obviously several miles from any roadway, topo maps showed a pack trail passing within about a quarter mile. We determined the closest trailhead getting there to be at Turpin Meadows, about 12 miles east of Moran Junction in GTNP. We planned to follow the most direct route, taking the Soda Fork Trail east to Crater Lake, crossing the continental divide by Ferry Lake, and descending to the Yellowstone River through Woodard Canyon. This route would be a long 22 miles in, starting at an elevation of 6940 feet, and crossing the divide at 10,300 feet. Definitely a challenge, but with pack horses and young legs, doable within our week long time allotment with a day or two left for fishing. About a week before leaving, we got updated information from another local, Charlie Gentry, who had just returned from a fishing trip to this same area. He informed us that cool weather throughout June had slowed the snowmelt in the upper elevations, and that there was still 3-4 feet of snow on the shaded slopes above 9,000 feet. Since this was the only week that worked for our schedules, we had no choice but to select an alternate course farther north and cross the divide at a lower elevation. Two Ocean Pass was almost 2,000 feet lower, but would add at least 20 miles to the trip. We crossed our fingers that warmer weather would prevent the need to go the long way. We left Soda Springs, Idaho at about six in the morning on a Monday, most of us having gotten only about four hours of sleep. We had nine people in our group, four leaders and five venture scouts. Myself, Alan Skinner, Rhett and Wade Price were the responsible ones, and the younger (15-18) Brett Torgesen, Marc Price, Chad Hubbard, David Barker and Coulter Skinner were the ones with more energy but slightly less enthusiasm. The three-hour drive to our starting point was slowed by encounters with two different herd of sheep, but we made it to Turpin Meadows by 10am. We had six horses, two of them for riding, four loaded to the gills with gear and enough food for the expected six-day trip. This would make it possible for the hikers to carry lighter packs, averaging about thirty pounds each. Lastly there was Hercules the dog, who is something like Tom Hank's sidekick Hooch and every bit the drooler. By noon we were loaded and had started on the trail, but lost about an hour looking for Alan's rifle which was lost in the first half mile. Before you go jumping to conclusions, just because we're from Idaho doesn’t mean we're a bunch of gun-toting rednecks- we were well informed of the need to carry protection from the Grizzlies in the area. We spent 5 - 6 hours hiking that first day, covering about 10.5 miles and gaining 700 feet in elevation. 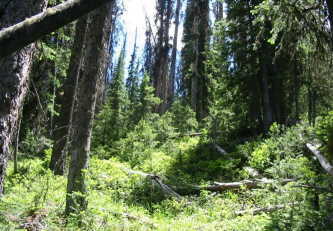 We started out following the North Buffalo Fork Trail past Mud Lake and through the Soda Fork Meadows. The trail is well traveled, mostly by teams of well-paid outfitters with a dozen or so fish hungry adventurers leading at least as many pack mules. Some we found to be friendly and helpful, but some were anxious to intimidate us into thinking we were foolish to be there without their services. About 5 miles in we passed the Soda Fork Trail heading off to the east. The boys were chomping at the bit to go that way and take their chances with the snow, desperate to avoid the extra mileage, but a chance encounter with a pair of hikers coming back out put the brakes on their mutiny. Consistent with reports from the previous week, at least 3 feet of snow still covered the high ground near the divide. There was no chance of making it with or without horses. We continued north through the North Fork Meadows finally stopping just before the North Buffalo Fork Trail turns east. When we made camp around 7pm, we were all pretty tired, and at this point, I was convinced there was little chance we would make it all the way in to the confluence and back. Part of me almost hoped we'd find the fishing so spectacular that we'd forget about our real destination and be happy just logging a legitimate attempt. A great meal and a decent night's sleep did a lot for my attitude though, and everybody seemed ready to go again in the morning. We continued north on the trail towards Two Ocean Pass, climbing about 900 feet in the first couple miles, peaking out around 8,600 feet. This would be the highest point we would reach on the trip, a good 1,700 feet lower in elevation than we would have had to climb per Plan "A". It was hard for the guys to believe the snow was such an impassible barrier at Crater Lake when we hadn’t seen any on our trail so far. Surely it was some sort of conspiracy on the part of the leaders just to make them hike an extra two days. Just over the top we crossed Trail Creek and followed it north about 4 more miles to Two Ocean Pass, which officially marks the Continental Divide. Here we detoured off the main trail about a quarter mile to see Parting of the Waters Natural Landmark. Two Ocean Creek appears no different from the hundreds of other streams flowing down out of the mountains here, yet somehow it happens to naturally split into two streams heading off in opposite directions. Water flowing down Atlantic Creek goes east along a 3,488 mile path through the Platte, Missouri and Mississippi rivers, into the Gulf of Mexico and finally to the Atlantic Ocean. Pacific Creek likewise heads west ending up in its namesake 1,353 miles away. A small fish (in theory) could use this route to avoid the Panama Canal in going from one ocean to the other. Marc and the gang attempted to prevent one such fish from pursuing it's destiny by catching it with their bare hands, but had no luck in completing the task. After lunch we followed Atlantic Creek northwest towards Hawks Rest where the Yellowstone River flows through several miles of marshland before entering the park boundary. The map shows the Atlantic Creek Trail passing through the marsh to Hawks Rest, meeting the main trail heading southeast, where we would follow the Yellowstone upstream to the confluence point. However, as we were coming around Yellowstone Point, just before entering the marsh, we passed through an outfitter's camp and stopped to question them about the crossing area. This bunch didn't give us much encouragement, either for crossing the marsh or making it to the confluence. We decided to head south here, following an unmapped trail, choosing to stay west of the marsh and avoid the bad crossing to Hawks Rest as the outfitters suggested. This trail would save us 2-3 miles, but not being on the map, it was less traveled and less maintained than the main trail, but still quite usable even with the loaded horses. We continued south about a mile before setting up camp. We continued south along the edge of the marsh, following the trail at the bottom of the mountain, which kept us just out of the wet grass. Not long on the trail, our group started to thin out as different paces lengthened the distance between us. Although not thrilled with the prospect of seventy miles of hiking, David seemed to always take the lead on the trail, keeping about a quarter mile ahead of us. This trail was narrower between trees than the main trails had been. We were reminded of this fact when one of the horse's packs crashed into a tree and was knocked off. We spent several minutes trying to get the horse and gear re-aligned while balancing ourselves on one of the steepest points on the hill. The farther south we went, the narrower and less clear the trail became. We soon found ourselves charting our own course either across small sections of the marsh or through trees, trying our best to follow the general path of the river. This obviously slowed our progress, and by lunchtime we had only made about 4 miles upstream. Here we came to a point where the semi-existent trail came to an abrupt end, where a mudslide had obliterated what used to be passable ground in a narrow neck between the river and steep hillside. We spent the better part of an hour determining which spot on the river was the shallowest point for us to cross. Finally we found a wide spot with a gravel bar island in the middle, where we were able to wade across or take turns carried over on the horses. After getting across the river we were all tired of hiking, and hungry too, so we broke out the food and enjoyed a break. Even though we hadn't gone very far, the day was half over and complaints about doing nothing but hiking had finally reached a breaking point. We decided we had better let the boys fish for a while and get a little enjoyment out of their trip. Half of us broke out fishing poles while the other half became unconscious right where we lay. A few hours later, nobody had caught anything but the general mood had improved. However, Newton's second law had a strong grasp on us by this point, and none of the 'bodies at rest' were anxious to get back on the hiking trail. I figured we were only about 5 miles downstream of the confluence, but our third day appeared that it might be over and we were still headed 'in'. Dr. Bowman had warned me earlier that if we hadn't reached the confluence by noon on Thursday, we had better be heading back to civilization (something about having to go back every mile that we had come in, and that it wasn't going to be any easier). Given this fact and that we’d only gone 4 miles, I wasn't very comfortable with the idea of stopping for the day. As it was, there were really only two of us who seemed bent on getting to the confluence, most of the boys were satisfied with earning their "50 miler" award and getting some good fishing in. Having their names on the Internet was merely a bonus if we actually got there. The Bishop and I were compelled by the challenge, driven by it really, and having gotten this close, we were more intent on completing our goal than ever before. One thing I wasn't telling anyone though, was that a tendon in my right leg had started hurting early that morning, and every step was painful. I wondered to myself if it was wise to continue going forward when I had so many miles to get back out. I still had my doubts that I would make it. Consensus was reached though, and we decided to stay. This bend of the Yellowstone was picturesque and had everything we needed for a good camp, so the poles stayed out and we relished the relaxation. We decided the previous night that we'd make the final push to the confluence on foot and pack as lightly as possible. This way we’d be able to make quick time and give the horses a rest. We had also given the boys a little pep talk about how we were almost there and it would be easy to get to the confluence carrying no packs, but if they really didn’t want to go, they could stay back with Alan and the horses. Well, come 8am it appeared only five of nine would be going all the way. We made at least three attempts at mustering the boys up, but even David the trailblazer wasn't able to give up the comfort of the sleeping bag. We set off at a quick pace doing about 3 mph, now that we were on the main trail again on the river’s east bank. The mountainous scenery around us was impressive, but we soon found ourselves in a part of the wilderness that had been almost totally stripped of vegetation by the park wildfires of 1988. Fifteen years after, most of the area was still dominated by tall, branchless tree trunks, blackened and lifeless. Wind had toppled many of them over the years, making the whole area look like a giant game of pickup sticks. This slowed our pace some as this part of the trail was not as well traveled and evidently didn't warrant the same priority for maintenance. Leaving the horses behind appeared to be a good idea as we were constantly going over, under or around the downed trees. About three miles upstream we spotted a small campsite at the edge of the river, just past the point where Castle Creek joins in. We'd noticed hoofprints along the trail and wondered if the Bowmans had made it this far. Sure enough, as we got closer we found the good doctor and most of his family, out along the riverbank trying to catch some breakfast. As we invaded their camp the kids seemed happy to see familiar faces and we swapped stories about our week. They had also wondered if we were going to make it, and Eric and Jared were glad we met up so they could join us in finding the confluence. We checked the map and realized we still had about 4 miles upstream to go. The Bowmans would catch up to us on horseback after grabbing a late breakfast. We quickly completed the final few miles on the east side of the river and then crashed in the trail to eat some lunch. We had just finished when Eric and Jared showed up on their horses and started looking for a good place to cross. The GPS showed that we were less than a quarter mile away, and I was starting to feel the excitement of almost accomplishing our goal. The farther south we had journeyed upriver, the narrower the canyon had become. We had gained a little elevation in the last half mile and were surprised to see how far below us the river was at this point. The Bowmans took the smart choice and started back downstream a bit to find an easier crossing. The rest of us, unwilling to go anywhere but in a straight line, found ourselves stumbling down the side of a steep ravine towards the river. When we got to the bottom, we found a rocky, narrow spillway where it was rushing through, impossible to wade and way too wide to jump across. Marc had gotten there first, and found a large log just long enough to bridge the gap from a large boulder to rocks on the other side. We took turns balancing our way across and made it with no casualties. We then scrambled and clawed our way up the steeper west bank, finally finding ourselves on top of a bluff where we rejoined the Bowmans. I think they had a good laugh watching us deal with the worst crossing place of the entire river. This was a perfect place for taking pictures of the general confluence area, which is where Picture 5 was taken. Now our sketchy digital navigating skills were put to the test. We broke out both GPS units we had, anxious to find the spot, only 500 yards away. We made our way quickly, crossing another stream, then up another steep hillside, closing the gap to 100 yards, and then round and round for about 10 minutes, working the decimal points closer and closer to zero. We finally both settled into a clearing among the trees, smack on the side of the hill (a point we had passed several minutes earlier) which didn't exactly fit our vision of the spot (but then, how often do they?) The boys wisely plopped down for a rest while the Bishop, Eric and I spent the next quarter hour trying to make the numbers match on the two units. Experienced confluence hunters would have realized much earlier that this was a futile act, here on the side of a hill amongst tall fir trees in the middle of nowhere, but we gave it a valiant effort anyway. Eric claimed to have seen all zeros on both units for a fraction of a second, but we could never capture it on film. Eventually realizing we would never get them to match, we celebrated our triumph, tagging the nearest treetrunk with a red ribbon, shouting yeehaw several times, and debating whether to shoot the dog and bury him there as a token of our conquest. I suppose the feeling was something like conquering Mount Everest, wanting the moment to last, but knowing we needed to leave. So, having done the deed and resolving to take the dog home alive, we headed back towards the river, this time willing to accommodate an easier crossing point. JUST HOW MUCH DOES A HORSE WEIGH? Once back to the horses, the Bowmans graciously offered to save us the time of switching to our wet clothes by ferrying us over the river on horseback. Jared and Marc started over first with Coulter and myself following behind. The opposite bank was pretty steep at the only clear getting out point, so you can probably guess what happened next. Yep, the horse lunged to get up out of the water, which sent Marc and Jared flying backwards, into the river on top of each other. This wasn't good, but the next thing we saw was the horse slipping on the unstable bank, still trying to get out. Seeing the danger, we yelled to Jared and Marc to get out of the way. Jared being mostly out of the water, heard the warning and luckily went left, away from the horse's backward path. Marc, still dragging himself up out of the cold river, veered to the right, unaware of what was heading his way. The horse had somehow avoided going directly over backwards by twisting to the right, and in the process came down directly on Marc's back. All this seemed to be happening in slow motion, and at the same moment came the sick feeling that comes when watching someone get seriously hurt. What could be worse? We were as far back in the wilderness as we could possibly be, and Marc had just been landed on by a horse! As the animal was still stumbling around trying to get its footing, we saw Marc, head dripping blood, dragging himself up out of the water and onto the riverbank. Not wanting to be landed on by our spooked horse, I jumped off its back in midstream as everyone ran towards Marc to see if he was okay. Jared immediately applied pressure to the gash on his forehead and we looked him over to see what the damage was. To our surprise, other than bruises and a sore left arm and back (from flying hoofs) he was in okay shape. We all knew that this was something of a miracle. We bandaged him up and dried him and Jared out the best we could, then decided to send them back to camp Bowman on horseback. Coulter, the Bishop and I started back towards camp on foot, hoping our wet feet wouldn't blister too badly before we could get them dried out again. The walk back was slow and quiet. A short time earlier we'd found our confluence, achieved our goal, and couldn't be happier. Now we wondered to ourselves at what price our success had come. The Bishop was willing to go all the way out that night if it turned out Marc needed more serious medical attention. After a couple hours walking with a few foot massage breaks, we encountered Dr. Bowman's oldest son coming towards us with an extra horse. I was grateful for the relief on my feet as we rode the remaining mile or so back to their camp. When we got there, we were treated with exceptional kindness by the Bowmans, who offered us snacks, drinks, dry socks and anything else we desired. Dr. Bowman had already cleaned Marc's wound and bandaged him up good. After resting awhile, he offered to take us back to our camp on horses, and again we gratefully accepted. Much to my surprise, the Bishop, Wade and Coulter decided they were going to fish their way back to our camp. On the way back, Marc and Jared (again sharing a horse) were riding along talking when all of a sudden, their horse reared up like Silver, dumping Marc to the ground. I vividly remember him falling, just as he did a few hours earlier from a different animal. He landed in a heap on the same bruised arm. I couldn't believe it. Twice in one day. He was slower to get up this time, but finally rose to his feet, insisting he was all right, but refusing to get back on any horse. Finally, Jared convinced him to get back on board with him leading on foot. Fortunately we finished our ride without further incident, although it was nearly dark by the time we got back. I could tell that Marc was going to be okay when he suggested that we pretend he had amnesia when we got back into camp. He tried to make it look good, but the other guys didn't buy it. They were, however, impressed by his wrapped head. Coulter showed up just after dark, somewhat soggy and by himself, having fished with the Bishop and Wade for a while then crossed through several marshy areas to get back. He hadn't caught anything, and said he'd left the other two some time ago. This made me nervous for two reasons - first, I had underestimated the distance back to our camp by at least a mile, and secondly, with an injured son and blistered feet, this hadn't been the best of days for the Bishop, and catching a fish was possibly the one thing that might have made things better. We hung out some lanterns hoping to help guide them in. Fortunately, about an hour later, they wandered into camp with several fish in hand and smiles on their faces. Over dinner we caught up on the day's events for the others. They'd all enjoyed sleeping in for a change, and didn't seem to care that the fishing hadn't improved. Brett and Chad had laid out on the makeshift beach, falling asleep for several more hours and Chad paying for it with a nasty sunburn. David had decided to put his scouting skills to work making a partial raft out of some logs and what little rope he could round up. Alan and the horses seemed grateful for the break too. They were all glad to hear that we'd made it to the confluence but weren't too disappointed that they'd missed the extra fifteen miles of trail. Only one thing remained to do, and that was to get back home again. Wade had caught enough fish to feed all of us for breakfast, after which we packed up and got ready to go. David thought he'd try to save some effort that morning by taking his raft downriver, but soon found out why rafts are always large and square on TV. Loaded up with his backpack, sleeping bag, and all his gear, David's shouts were heard all through the valley as his ship overturned and he went down like a torpedoed captain. We crossed back over the river and started down the trail the way we'd came, making better time than on the way in. Along the way we had to forcibly remove Marc's pack from him, he being sore from the previous day's multiple accidents but not wanting to show it. Getting him to swallow some Advil was almost as bad. Before noon we had made it back to Camp Two, but stopped short in the trail upon sighting an animal out in the marsh. By its shape and color we could tell it was a horse, but we didn’t know if it was still alive. Breaking out the guns, our party cautiously ventured out to the scene to survey the damage. They found the kill to be at least a day old, with long, wide, claw marks along the belly and neckline. It seemed strange to find an animal attacked in such a way, mostly uneaten. The Bishop suggested that this was probably because grizzlies prefer their food 'tenderized', a few days later. With the horrible smell and the abundance of flies, we figured he was probably right. It was after the fact that we realized that it might not have been such a great idea to get such an up close look at a grizzly bear's meal. We circled Yellowstone point and decided to travel back through Two Ocean Pass along the south side of Atlantic Creek, passing an outfitter's camp in a large meadow. We waded across and then dropped our packs right there in the creekbed and had lunch. Afterwards, we went only another couple miles west when we found a good looking campsite, complete with a bearbox, on a bluff overlooking Atlantic Creek. We had heard that the fishing had been great here only a week or two earlier, so the temptation to stay and get one more try at decent fishing was strong. After all, it was the 4th of July and we thought we should enjoy some of the holiday. We set up camp for the last time, myself taking some satisfaction in the thought that this would be the last night in the at-freezing night temperatures. My ultra-light sleeping bag was just enough insulation to keep me from shivering all night, as long as the drawstring was tight around my face, but it's slick nylon exterior was a bad combination with the thin half length air pad I had gotten specially for the trip. Trying to stay on top of it while constantly rolling from one side to the other to save my back was like some kind of bad surfing nightmare. Just thinking about being back home in my own bed brought a smile to my face. We pulled out our fishing poles one last time with big expectations, as a local had bragged about pulling 100 fish out of this same creek the week before. Apparently they had gotten them all - Marc claimed to have snagged a six-inch minnow, but that was the only thing to come out of the creek for us. Well, that and a foolishly friendly beaver that David claimed had a death wish, but that's another story. We again feasted on another gourmet wilderness meal (not the beaver), then eventually turned in after a lecture on being nice to the animals. The only thing we lacked that night was a fireworks display. Stopping early at Atlantic Creek Friday afternoon for the fishing would probably have been better remembered if there had been any fish. I was not looking forward to the final 18-mile trek back to the trucks. My foot had continued to bother me on the trail, and today it seemed worse. Everyone was anxious to get back home, and we started right off at a fast pace. Most of the guys had shed some (or all) of their load by this point, rationalizing that the horses had less to carry since our food was nearly gone. At first, every step was painful, and it took nearly an hour for my tendon to warm up. After that, as long as I was careful, it didn't hurt too much. We stayed together for the most part for the first 4 miles or so back up to the top of the pass. Most of it looked familiar, and each recognized landmark was a welcome sight as we marked the distance getting shorter and shorter towards home. We made good time getting to the top, stopping only a couple times to rest and pump water. The horses were doing well, seemingly just as aware that we were on our way home. Coming down the far side was a little more painful, as the trail was steep and required effort to keep a walking pace. We stopped again as we reached the North Fork Meadows, near Camp One, and parked ourselves nearly in the middle of the trail to dig out the last of our food and eat lunch. Starving and worn out as usual, we weren't paying much attention to our surroundings when an outfitter's mule team suddenly was coming down the trail towards us. We hurriedly attempted to get ourselves and horses off and away from the trail, when we overheard the lead man saying something to his companions about 'taking us out'. The Bishop was extremely unimpressed by this display of inhospitality and informed them of this fact while holding his sidearm in the air. They continued on through without stopping for more discussion. It was about this time that I really started feeling more of my feet, sore back, shoulders, and sunburned face - I had lost my hat two days before and was wearing only a small towel wrapped around my head for protection from the sun. I didn't intend on slowing down, but just seemed to naturally lag more and more behind the rest of the group with every mile. They stopped every hour or so to pump water and rest on the rocks, and it seemed I had more distance to catch up each time they did. Walking the four miles through the North Fork Meadows seemed to take forever. Brett had a little help from some of the other guys who decided his pace had been a little too fast. At one of our water stops, he discovered a small pile of rocks along for the ride in his backpack. The fast pace continued all the way back. The Soda Fork Meadow took even longer to walk. Approaching Mud Lake, it seemed like we had passed all the same landmarks more than once. The last couple miles lasted forever. I was sure that the others had been back for a long time. I remembered the last mile quite well, and was so glad to see it. When I finally made it up the last slope from the creek, I saw the Tetons in the distance, just as I had nearly a week earlier. This was the view I had been anticipating for several days, the sight which signified completing the trek. I walked the last couple hundred yards to the gate, closed it and drug myself over to the cars. We had made it. After loading up the horses and the gear, we headed back to Jackson. The closer we got to civilization the more we realized just how bad we looked and smelled. Our hunger beat out our embarrassment however, as we found an all-you-can-eat Pizza Hut buffet to invade. The place looked like a disaster area after we finished, and we got plenty of stares from the people around us. The waitress commented that she thought we were a bunch of construction workers who’d had a particularly rough day. If she only knew. #1: At the confluence, looking west. #2: Our group entering the Soda Fork Meadows, 5 miles in. #3: Two Ocean Pass - Parting of the Waters. About 17 miles in, but only halfway to the confluence. #4: Wilderness Area burned by the '88 Yellowstone Park fires. 4 miles north of confluence. #5: Headwaters of the Yellowstone River, looking North. The confluence is about 400 yards up the hill to the left. #6: 44 N 110 W, at 8,353 feet. It's 2pm on the 4th day. We better start heading home.